When shopping for Thai or Asian ingredients in Oakland, California, one of the best areas is the International District, which covers International Boulevard (formerly East 14th Street) and East 12th Street. 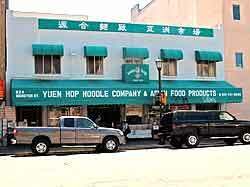 There are many Southeast Asian and Chinese markets on these two streets from the Lake Merritt end to 17th Avenue. In this blog I’ll talk about the markets where Kasma shops for ingredients, both for her personal use and for her Thai Cooking Classes. As I mentioned in a previous blog, Shopping at Asian Markets (for Thai Ingredients), more often than not Kasma goes to a number of markets on her shopping trips; different markets carry different ingredients and she always tries to get absolutely the freshest ingredients and the best brands of packaged products. 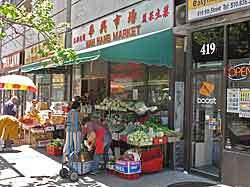 International Boulevard, the old East 14th Street in Oakland, and East 12th Street are intersected by the numbered avenues, beginning with First Avenue. 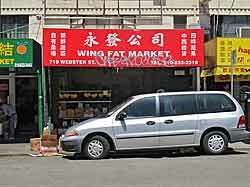 Up until about 17th Avenue, the stores are primarily Asian; after that, the flavor turns more Hispanic. 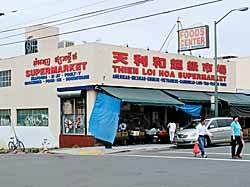 It is one of the two main districts for Asian supermarkets in Oakland, the other being Oakland’s Chinatown situated from 7th to 9th Streets bordered by Broadway to the west. One of the advantages of shopping at International Boulevard is that many of the stores have parking lots. I list this market first because it is the market Kasma frequents the most out on International Boulevard. The market is run by Cambodians and is a great source for hard-to-find Southeast Asian ingredients, such as holy basil, kaffir lime leaves, cha-om, bai chaploo and more. 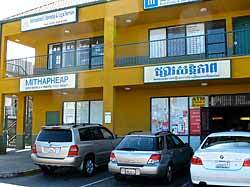 Read Kasma’s blog Mitapheap (was Sontepheap) Market in Oakland to find out more. There’s a small parking lot right by the store. 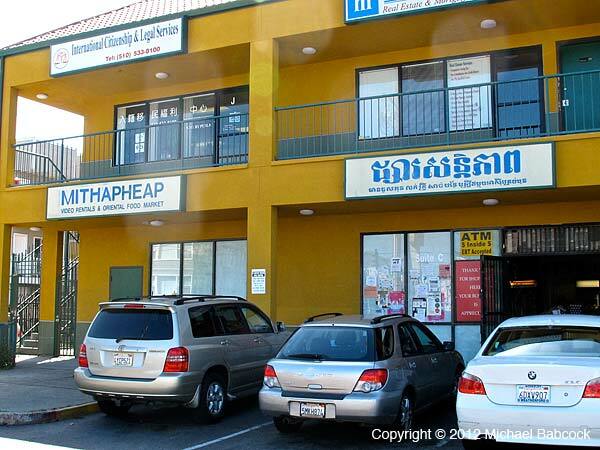 The name was changed from Sontepheap to Mitapheap in early 2012. 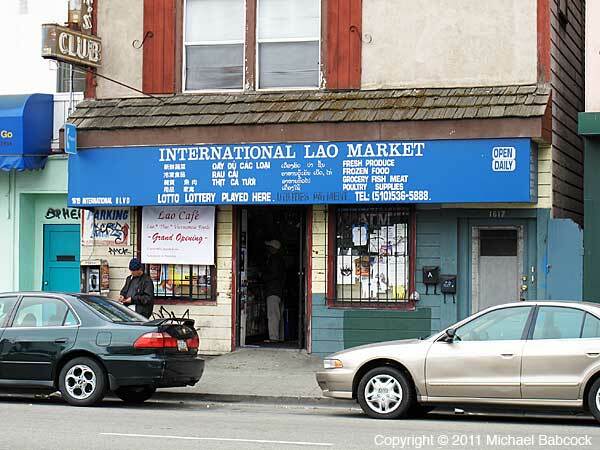 The International Lao Market, owned by Laotians, gets second position because Kasma often goes there for hard-to-find produce items when they are not available at Sontepheap. The market also carries many frozen, bottled and packaged goods from Thailand, including one of Kasma’s favorite fish sauce brands – Tra Chang – as well as her favorite brand of shrimp paste (kapi) – Klong Kohn. This is one place Kasma’s students can find clay, stone and wooden mortars and pestles. Nearby street parking is usually available. 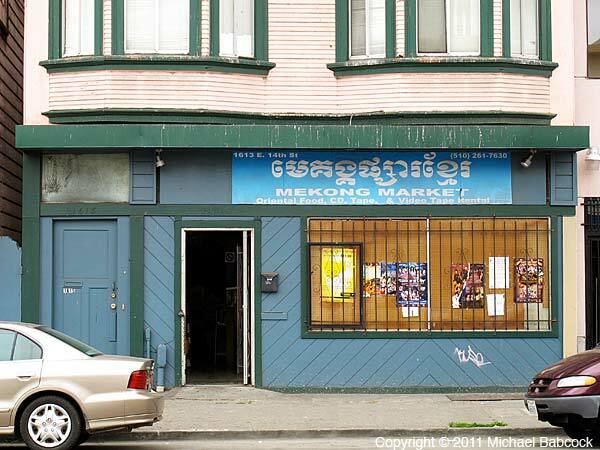 Although it’s a small store, I’m including Mekong Market here because it is right next to the International Lao Market. The proprietress is Cambodian and Kasma uses this as a back-up for ingredients such as Thai eggplants, holy basil and kaffir lime leaves. Of the Southeast Asian cuisines, Cambodian and Lao foods share the most similarities with Thai and markets run by people from these two countries are more likely to carry the hard-to-find fresh ingredients also used in Thai cooking. 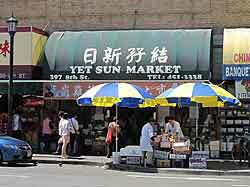 Also on East 12th Street, Thien Loi Hoa is a fairly large and complete market. They have fresh and frozen seafood in addition to produce and a butcher. In the freezers are also various Southeast Asian herbs and vegetables, like cha-om and sadao (neem). This is the only market in Oakland where Kasma can find pickled garlic from Thailand without preservatives in vacuum-sealed bags in the refrigerated section. In the same section, there’s usually the sometimes hard-to-find salted mackerel from Thailand. Fresh duck eggs are frequently available here, too. The store has a small parking lot; I’m usually able to find a spot. Lucky Fish Market is right across the street from Thien Loi Hoa and is a good place to look for fresh fish, including live ones in the tanks, and other seafood such as crabs and lobsters. 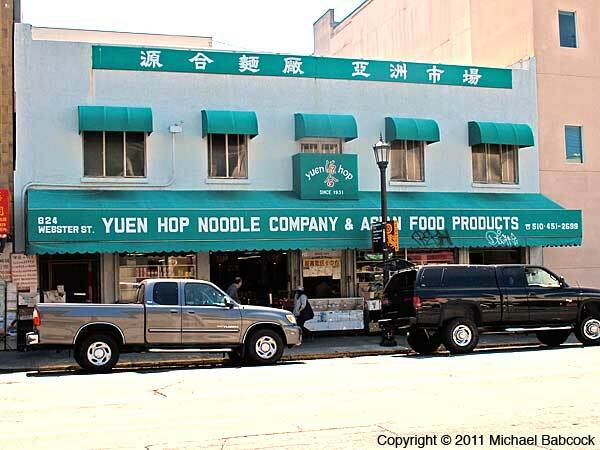 They have another market on 8th street in Oakland’s Chinatown. Thien Loi Hoa and Sun Sang (see next entry) also have fresh fish, if you can’t find what you’re looking for here. 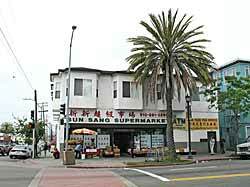 A fairly large Asian grocery store with produce and a meat counter. Kasma used to go there specifically to buy Lion and Globe Peanut oil in 5 liter bottles but lately they have only the smaller sizes. The store has a large selection of frozen seafood products and also a fairly good fresh fish counter. 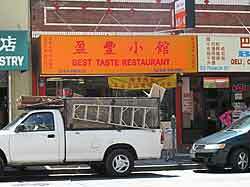 One of the two best locales to shop for Asian ingredients in Oakland, California is Oakland’s Chinatown. 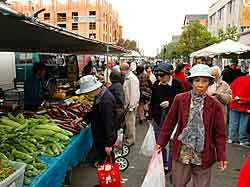 When Kasma does her weekly shopping for her Thai cooking classes, she invariably begins at Oakland’s Chinatown. Below are the stores where she shops. One map I came across shows Oakland’s Chinatown Boundaries as a rectangle bound by Broadway and Oak on two sides and 6th Street and 11th Street on the other two sides. The stores where Kasma shops are all within a narrower area, bounded by Broadway and Webster on two sides and 7th Street and 9th Street on the other sides. 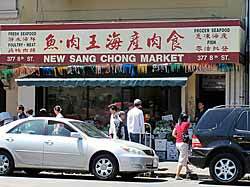 Although it is called Chinatown, it is really more pan-Asian as the stores are run not only by Chinese but also by Southeast Asians such as Vietnamese. 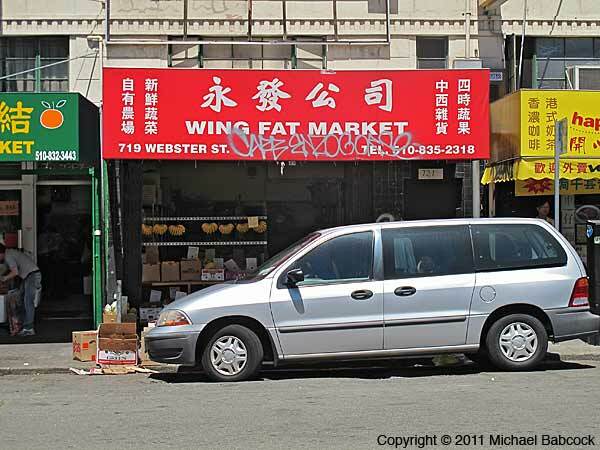 Street parking can be somewhat hard to find in Chinatown, particularly on 8th Street and 9th Street where there are many stores. Double-parked vehicles, including large delivery trucks, are very common on these two streets. On weekday mornings, Kasma can sometimes find parking on Broadway between 8th Street and 9th Street. When I shop here I usually drive up 9th Street (it’s a one-way street) coming from Clay Street and park at the metered-street parking either between Clay and Washington or between Washington and Broadway. Alternatively, there’s a parking lot under the Asian Cultural Center, which is found on Franklin Street in-between 9th and 10th. Drive up 9th (one-way) from Broadway and turn onto Franklin (left only, Franklin is one-way) and the parking lot is underground to your right. It costs the same to park here as on the street, but they charge in hour-long increments. Wah Hang Market is a small shop just on 9th street between Broadway and Franklin. Kasma occasionally stops here mainly to look for fresh produce; if Khanh Phong is out of a certain item or if the freshness is not to Kasma’s liking, she’ll stroll down here and see what is on display. 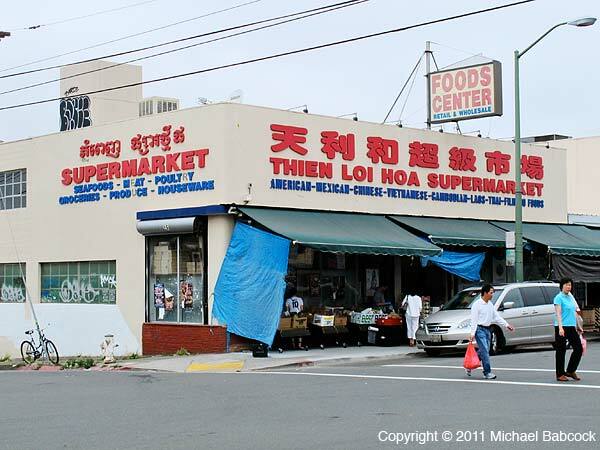 She’ll also buy certain cuts of pork here, again, if Khanh Phong doesn’t have what pleases her. Kasma comes to Yuen Hop Noodle Company basically for two items. One is the loosely packed bags of fresh-made rice noodles, which are the best rice noodles on this side of the Bay. The other is a snack – Chinese-style mochi (sticky rice dough balls) stuffed with a ground black sesame and peanut filling that is very good and a favorite snack among her students. Both are usually sold out before noon. 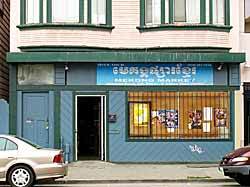 Although it is called the “Noodle Company”, the store is more or less a typical Asian grocery store carrying a wide variety of fresh produce, dried seafood products (occasionally the hard-to-find salted mackerel), and packaged and canned goods. The cookware aisles are worth a look. 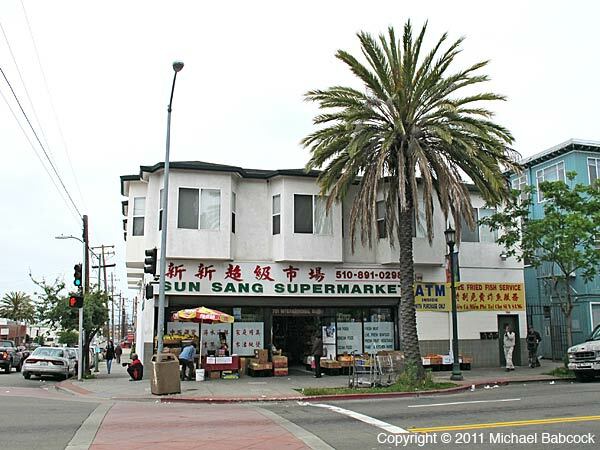 I’m including this smaller, Asian market just for the sake of completeness. Kasma comes here mainly to look for nino (” baby”) bananas (Thais call them “egg bananas”) if she can’t find them at the right stage of ripeness for cooking that she needs at other stores. This store seems to always have bunches of these bananas hanging from wire hooks at the front. 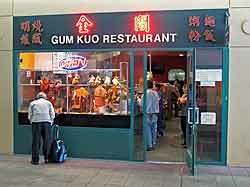 Kasma stops here to get char siu – Chinese barbecued red pork. Their roast duck and crispy-skin roast pork are also quite good. A good place for a quick, inexpensive lunch. Fridays, 8:00 a.m. to 2:00 p.m.
On Friday mornings, the Old Oakland Farmer’s Market is a great place to get Asian produce. 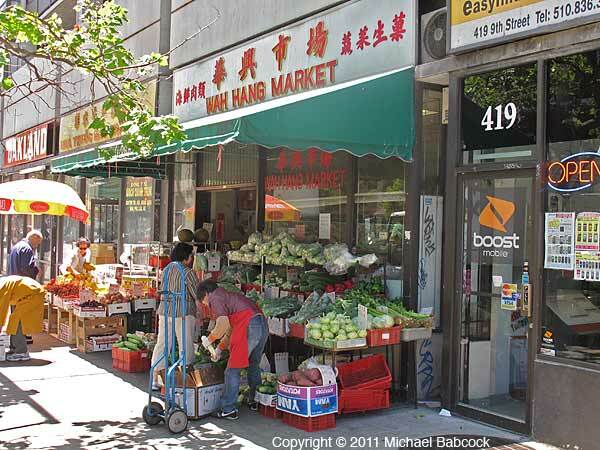 There’s a large number of Asian vendors, many of them immigrant Southeast Asian farmers including Hmong and other hilltribes. The produce is very fresh and the prices are among the best you’ll find. It pays to get to the market as early as you can as store owners often come early in search of hard-to-find produce for their stores, such as pea eggplants, Thai eggplants, holy basil, lemon basil and chayote greens. Many stalls are ready to sell even before 8:00 a.m., the official opening time. In addition to produce, we come here for very fresh duck eggs; our Filipino mailman swears by the balut we get here. There are also stalls selling ready-made food and a few tables set up for people to eat. See our earlier blog Old Oakland Farmer’s Market. 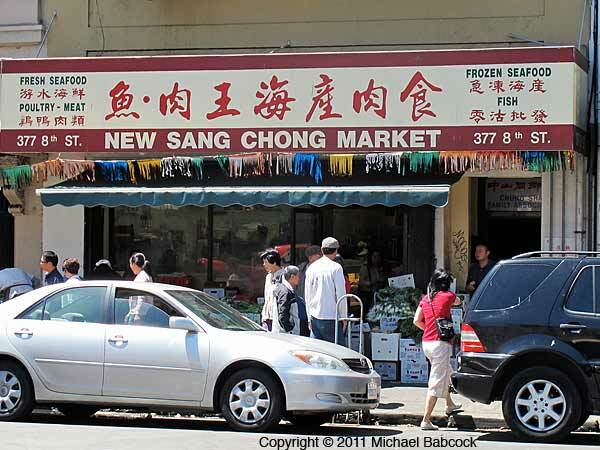 New Sang Chong Market is where Kasma usually looks for fresh fish first. 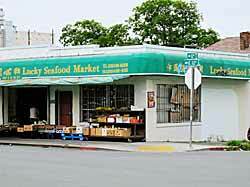 Although the selection is not as large as Lucky Fish Market (across the street), the fish tends to be fresher. In addition they sell what in Thai would be called gai bahn, literally “house chicken.” These free-range chickens are a much smaller variety than that found in traditional American supermarkets and have a much better flavor. When Kasma was perfecting her Thai Southern Fried Chicken Recipe, she was able to get the result she wanted only from this smaller variety of chicken. The chickens are sold with head and feet on. The market also has a butcher, a good selection of frozen seafood, and fresh produce. 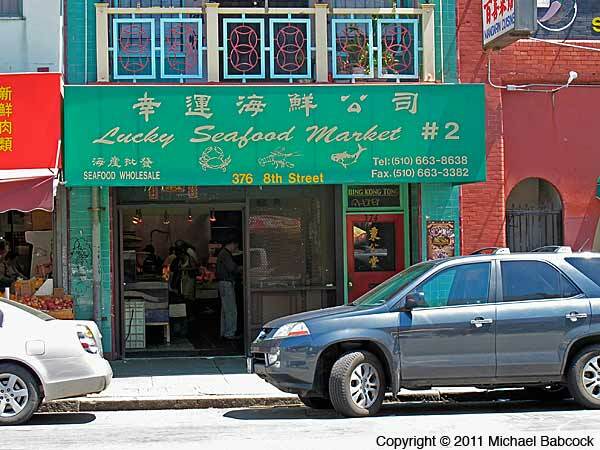 No longer called Lucky, still a fish market. This is the largest of the three fishmongers on this block. 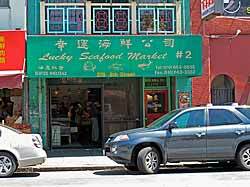 There’s also a Lucky Seafood Market on International Boulevard, the other good locale for markets with Asian ingredients in Oakland – a blog to follow soon. 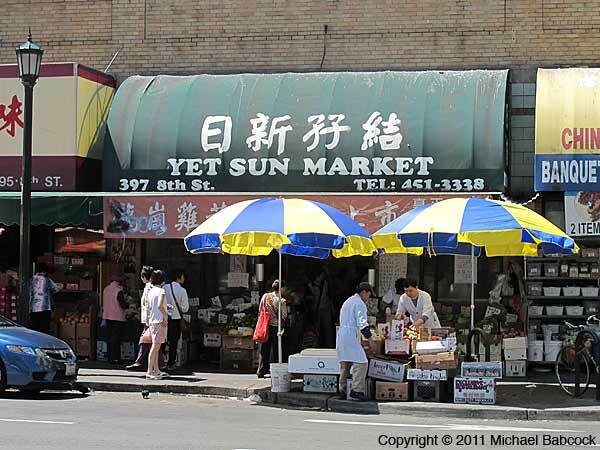 Yet Sung Market is the third market with fresh seafood and also the smaller variety of free-range whole chicken with head and feet still on. They also have very fresh produce, well worth a look here. You are currently browsing the Thai Food and Travel Blog blog archives for August, 2011.